This post was also published at my WordPress blog Webs and Threads. At June Underwood’s invitation I am sharing this interesting work by weaver Aymar Ccopacatty since it coincides with my recent travel and experiences with trash in India. Aymar’s emphasis in weaving is on using trash found in the landscape of Peru. 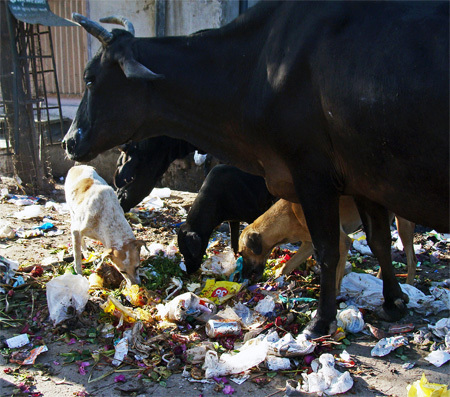 One of the things that is ubiquitous in India is the presence of trash. This is something that seems to exist whether in city or countryside and it was quite an overwhelming part of being in this country for the first time. The roadsides are covered in it; adults, children, and animals seem oblivious to the tide of discarded paper and trash of every type that is part of everyday life. I had an opportunity in Udaipur to chat with an Indian activist, visiting from his home in California. He was a guest at the home of my friends there, sharing with them their great passion for aiding the people of India. In the course of our conversation I did ask finally, about this tremendous problem. His answer made perfect sense. In times past, he explained, trash in India was of the organic kind which in time, would degrade or decay. The trash of the 20th and 21st Centuries has an infinite lifespan and confounds the old traditions of keeping the interiors of homes spotless by sweeping out daily litter from the door. A street scene in India. A gypsy camp by the roadside in India at dusk. So the topic of trash was in my mind when I received an email announcement for an exhibition from an artist I’ve known since his first exhibition at the age of three. Aymar Ccopacatty had just immigrated from Peru with his Peruvian father and American mother when we met. His father Peruko, is also an artist and comes from the ancient Peruvian people, the Aymara. Now thirty, Aymar Ccopacatty, spends time both in the United States and in Peru where he pursues his weaving and is passionate as well about preserving the ancient Peruvian traditions of weaving. Recently Aymar sent me an announcement of his exhibition in New York City of the weavings he had created using trash from the landscape of Peru. As in India, the old and the new seem to collide in Peru, without a means of managing the detritus of modern times. Aymar has addressed the situation in Peru by using trash to spin and weave into art, a powerful statement about his culture and the relationship of his traditions with the West. Here is a scene sent by Aymar of a lake view in Peru. Following is a statement from Aymar on what he considers his life’s work, preserving the ancient traditions of weaving as they meet with the changing modern influences in the Peruvian culture. “I was born in Peru, my Father’s land, of two distinct cultures.We lived there until my second birthday, before returning to my Mother’s land in the U.S. Since then, much of my life’s exploration has been dedicated to fully understanding the dichotomies of these two greatly different cultures as they exist within and outside of myself. I am a weaver. My work combines modern material with ancient technique. I n myexplorations I have built looms, spun and knitted using trash such as plastic and rubber tires. Much of the trash comes from Lake Titicaca, an ancient and ecologically sensitive environment 12,000 feet above sea level. The language and culture here is Aymara, a millennial language dating back to pre-Inca Wari and Tiwanaku empires. The work is a synthesis of tradition with modernity. I feelthat sometimes tradition must change and build upon its origins in order to achieve continued relevance in modern contexts, while also serving as a vehicle to express the concerns of an isolated and culturally marginalized people on the fringes of Peruvian society. I learned the techniques of spinning, weaving and knitting within a traditional indigenous Aymara lifestyle. My Grandmother Maria, a master weaver, would spend her days in the fields and nights at home, all the while spinning her drop spindle to a rhythm of lake and sky. At the age of fifteen I began learning from her. Traditionally men wove bolts of cloth on a stiff heddle loom, and the women wove their elaborate and colorful designs on string-heddled tension looms. I saw that as things changed, both men and women might abandon this knowledge completely. Slowly this abandonment has come to pass. The Awayu is the traditional carrying cloth of Andean women. As the Aymara enter modernity many of these traditional cloths are now being made of synthetic materials on machine looms. This combination of new material and process cuts us off from the past. The traditional Andean weavings are warp-faced and are strung up to the desired final length. If looked at from the side, one sees the shape as an Infinity symbol. They are never cut or sewn. The older weavings are thought to contain a bit of the Elder’s presence and energy, and are therefore sacred. Within the traditional weaving of the Aymara, originating millennia ago, are held elements of color, composition, and structure that form a metaphysical complexity and language of great cultural meaning. This art form is now threatened with extinction. Peru is a nation built on layers and layers of human habitation and pre-Colombian cultures dating back through time. Now, more than five hundred years after the Spanish conquest, the nation is just beginning to accept its indigenous identity and rich past. As with most indigenous peoples worldwide, life for these peoples in modern Peru hasn’t been equal or fair. This interplay between ancient and modern society is something very necessary today. Though both societies find each other sharing a shrinking Planet, there is room for all. Indigenous people combine form and function. Woven and knitted pieces, are simultaneously used to acknowledge and celebrate our ceremonial place in the Universe, while also providing everyday uses such as, clothing, backpacks, lower back support, plates, weaponry, boats and roofs. Spiritual significance is not separated from functional object. This unity of ideas over time have found expression in my people’s weaving tradition. Beautiful examples of the transformation of trash from the Peruvian landscape into art by Aymar Ccopacatty. As an experimental textile artist, Aymar has used interesting methods and materials to weave his pieces. With an emphasis on found materials, you will see that he has recycled both the “fiber” and the loom from found material of the most humble and simple variety. While “found” objects and material are now often used in the making of art, Aymar’s work invests an intention in his pieces that draws on his heritage and calls upon us to view them in that context. They are both thoroughly “new” and “old” at the same time. but these excuses won’t wash for the rest of us and too many people simply hurl their trash into the world…. The compression of time and place that seems to be accelerating certainly throws this problem into high relief on our landscapes. Even 40,000-year-old cultures are now a part of it. Perhaps it is our task, having created objects that do not decompose naturally, to figure out how to clean up our planet. Re-using these artificial things, whether as art, or to be re-cycled into other useful objects, is a beginning. Trash is such an all pervasive basic material these days – I recently discovered that there is so much of it in the Pacific that it is already forming a considerable contribution to the sediment. In centuries to come it will be seen as a distinct layer in the geology. It will be like one of those distinct layers in the Grand Canyon. Recycling has always been told about and how many practice is something that is yet to be detected. A very interesting post, thanks. I found your friend Aymar’s weavings beautiful, and was most struck by his saying that spiritual meaning did not have to be separate from functional objects. I believe that textiles connect me as an artist to both functionality and spirituality as well as history. And that feeling is transmitted to me consciously and unconsciously in the tactile nature of cloth. I can easily imagine such a scene. It’s clear that the creative impulse lives in a great variety of settings and environments. We can only hope that the great traditions such as the embroidery you saw continue to be practiced and handed down as the influences of modern culture intrude. I am fascinated by this posting! On a visit to the remote north west of Viet Nam I noticed how much trash there was lying around in the villages we trekked through. The women still wear their traditional costumes which incorporate the most extraordiary embroidery and women seem to spend every spare moment stitching (I even saw a woman in Sapa sitting on the kerb in the pouring rain, bending over her embroidery and stitching away) and yet there was trash everywhere we went. I believe this posting gives me greater insight into the reasons why.